18 Aug, 2016 in color wheel marketing / income / marketing / social media / speaking by Minette Riordan, Ph.D. 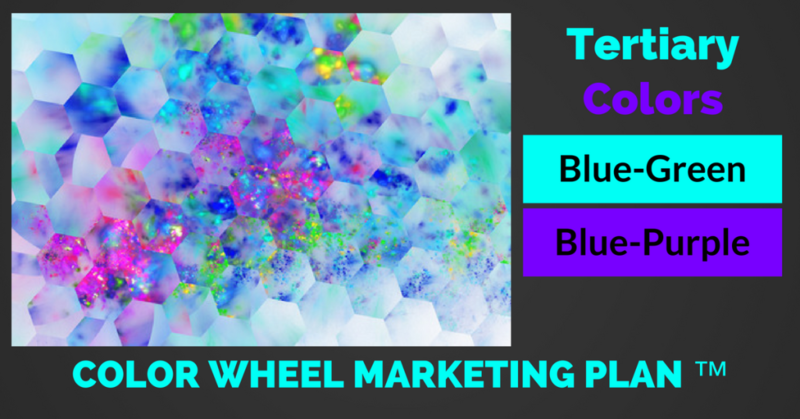 This is Part 3 of our series of the Tertiary Colors of the Color Wheel Marketing Plan ™. Part two is here. Did you know that blue-green has been a Crayola crayon color since 1949? I love statistics like this because they make marketing and art fun. Who doesn’t love a brand-new box of Crayola crayons? In the last section on yellow-green, we talked about using social media as a valuable tactic for creative entrepreneurs. The use of the primary color yellow put more emphasis on showing off your talents and unique genius. Remember that all your marketing flows from the center of the color wheel. With the color blue-green, the emphasis shifts back to blue, with just a touch of yellow, and remember, blue represents the problems you solve for your clients. Some of the best ways to do this involve blue-green tactics like blogging, visiting other people’s sites and commenting on their posts, following other experts you admire and letting them know what you like about them, or sharing advice and insights in groups, forums, and online chat rooms such as Facebook and LinkedIn. These blue-green marketing tactics, combined with your social media strategy, will work together to attract a steady stream of people to your business. Cue the parrot, a beautiful blue-green macaw that is repeating the mantra of this book: “Marketing is not about you, but about your clients and their Three Ps.” Can’t you just hear that macaw over and over again, squawking “Pains, Problems, and Predicaments. Pains, Problems, and Predicaments”? “But I’m an artist,” you might be saying. “I have to show my work!” Well, of course you do, but how you position your work is important. Whether you are a painter, writer, editor, graphic designer, or business coach, showing examples of your work is important, but how you talk about it is what makes it attractive to the 67 percent. Take a look at Jane Davenport’s website. What do you notice? I feel invited to play, and I feel welcomed in a place that I know will be creative. It calls out to my creative spirit of play and whimsy. Keep exploring the site. There are plenty of offers to play, to buy, and to learn. It’s a great example of educating and inviting me to join her tribe. This section of the color wheel is all about content. Freely share what it is that you know how to do well! Don’t be stingy with your content or with your creativity. Don’t waste time being humble or modest or thinking your advice doesn’t have value. Someone out there needs to hear what you have to say! Give away, share, post, or tweet lots of fabulous online content that showcases your expertise. This is one of the quickest ways to build your credibility with others and to make that “know, like, trust” factor occur more quickly. It’s also much more effective than giving away your time as you can help many more people. Interacting and sharing advice and ideas in forums, Facebook groups, and LinkedIn groups. In this section of your color wheel, think about which of these tactics makes the most sense for you. Keeping your website fresh, attractive, and up-to-date is an ongoing project but not a daily one. Blogging is something that I personally think every creative entrepreneur should add to their marketing plan. Why? Because writing one blog post or article per week can generate enough content to fill all your other marketing tactics. Remember that you don’t have to be a great writer to start blogging, just a competent one. Also, if you struggle with writing, use images, art, cartoons, or video in your blog. Invite others to be guest bloggers on your website or interview experts and share your interviews on your blog. Sometimes you just need a quick health check to get you started on the right path. Click below and you’ll get immediate access to our Free Marketing Basics Quiz and Training Video, and ongoing great resources from the Path to Profit Academy. This is the final tertiary color on our color wheel, blue-purple. The blue-purple section, similar to the blue-green section, requires that you educate your clients about how to work with you and how you can best help them. The difference is that I want you to get out from behind your computer and educate people face-to-face. I know for some of you this section may cause fear, panic, and the desire to run and hide! Take a deep breath. There are many forms of public speaking, and perhaps one of them will feel right for you. Speaking is one of the fastest ways to grow your business—no matter what business you are in! You get to decide if your desire to attract cash and clients is bigger than your fear of appearing in public. I completely empathize with how painful it is to stand up in front of a room feeling nervous, sick to your stomach, and afraid of looking silly, stupid, etc. I’ve been there. I used to get so nauseous from nerves that I couldn’t eat for hours before a presentation. “Practice makes perfect” is one adage that I adhere to. The more often I got up and spoke in front of a group, the better I got at it. I still get nervous when I speak, and most people I know who do a lot of public speaking say they also get nervous before an event, even if they have been speaking for years! Here are examples of how you might use public speaking in your business. All of these events are ones that you personally create, market, and fill in on your own or with your strategic partners. Free Self-Hosted Events: you invite people to listen to you speak in a public venue with the goal of offering content and selling people into a program, workshop, coaching program, or other service. This would work well for artists who invite people in to see their work and learn more about their craft. It would also work well for graphic designers or interior designers who want to share some do-it-yourself tips with potential clients. You might be wondering how sharing DIY tips can get you clients. Doesn’t it just encourage people to do it themselves? Yes, sometimes, but more often than not, people realize how much work and expertise is involved—or they fall in love with you and your particular style of design. These events are intended to attract new fans who will become clients, if not now then at some point in time. In-Person Paid Workshops: you offer educational content based on a specific topic that solves a certain problem for your clients. For example, I could do a three-hour workshop on just Color Wheel Marketing or Learning to Love Money. Other ideas would be art classes, jewelry making, stress relief or meditation, movement, writing—anything to do with your business that you can teach others how to do for themselves. Home Parties: you invite a small group of people into your home, offer great content, and then offer them the opportunity to join a paid workshop, coaching session, event, etc. This is a great lead-in to the paid workshops suggested above or to retreats or other ongoing programs. Alternatively, you could ask a client to host a home party for you and invite their friends/colleagues to hear you speak. Hosting Live Events: you host a two- or three-day live training event with the goal of selling people into a longer-term, group coaching program. This is a very popular model in the coaching industry. Live Retreats: you host at either a hotel or a retreat center in your community, in a larger city nearby, or even in exotic locations around the world. Retreats tend to be smaller and more intensive than live events. People will pay well to attend an exclusive retreat. The retreat model works well for artists, coaches, healers, therapists, or educators. You could spend a whole weekend on copywriting or business planning just as easily as you could spend a weekend teaching art and yoga. Be creative and don’t assume a particular model won’t work for you. As I told you in my introduction, I have been a successful entrepreneur for close to fifteen years. I have already built one six-figure business and am currently building my second one. Speaking has been a key part of my marketing success. If I can do it, so can you. Speaking has been the best way for me to get in front of larger groups of people all at once and give them a taste of who I am. You can learn only so much about me (or anyone) from reading what I write or share in a book, blog post, or social networking site. In contemplating these different public speaking strategies, which one would you be willing to add to the blue-purple section of your color wheel? Just one! Add it to your color wheel now. Your color wheel should be looking quite full and colorful at this point. Now that you have all of these ideas, it’s time to turn some of the tactics into regular habits. Once you have a consistent plan in place and you commit to taking daily action, cash and clients will begin to flow in on a more regular basis. This is Part 3 in a series of three blog posts and completes our overall Color Wheel Marketing Plan … we hope you enjoyed it! Parts of this post originally appeared in Minette’s bestseller, The Artful Marketer.